Today’s globally interconnected world calls for our leaders to work together for the common good, utilizing our individual strengths and gifts to embrace our biggest challenges with disciplined analysis and creativity. At Hawken, students are learning to do just that, and the Hawken Fund provides the philanthropic foundation that helps make all this possible. Every hour of every day, the Hawken Fund fuels the foundational experiences that prepare students to be strong leaders with a personal commitment to Fair Play. What is the Hawken Fund? The Hawken Fund is our annual school fundraiser. Alumni, parents, grandparents, faculty, staff, and friends come together to demonstrate their commitment to Hawken’s mission by making a gift to the Hawken Fund. Every year, the Hawken Fund is the School’s top fundraising priority. Where does Hawken Fund money go? The Hawken Fund helps to bridge the gap between tuition revenue and the true cost of a Hawken education. This chart shows the revenue source for Hawken’s budget. Hawken is no different from all independent schools and universities in asking for philanthropic support in addition to tuition. Gifts to the Hawken Fund support the people and programs that make Hawken so special – talented faculty, small class sizes, technology, etc. The Hawken experience is distinctive due to its emphasis on experiential and project-based learning. For example, students meaningfully engage with the real world during Passion Project time in the Lower School, Doorways trips and Insights Week in the Middle School, and through Intensives in the Upper School. Unique learning opportunities like these come at a cost – part of which parents are charged in tuition. 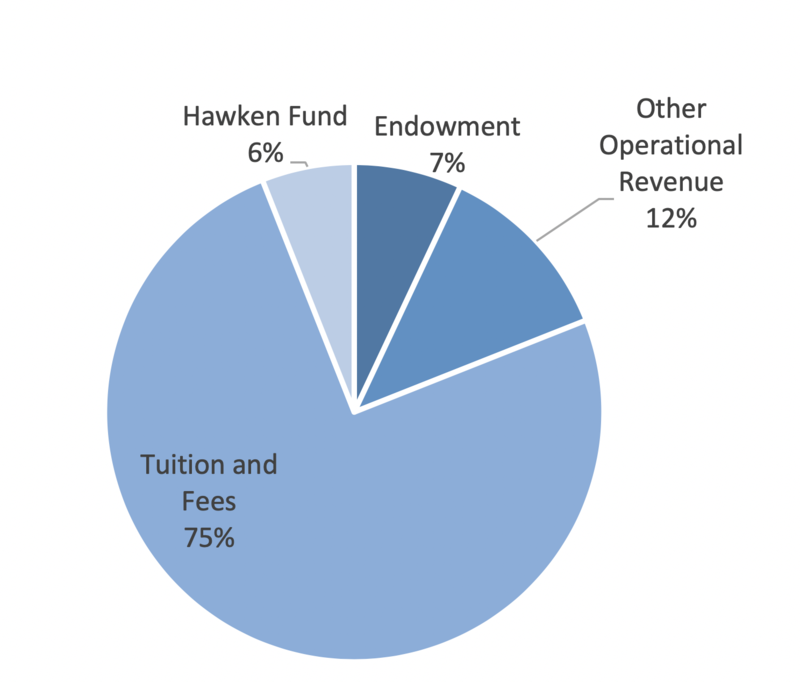 Tuition revenue covers 75% of Hawken’s operating expenses. Philanthropic support of the School, including support of the Hawken Fund, helps to bridge the budget gap every year. Annual giving is a strong tradition at Hawken, and with your participation, you’re part of something big. Every gift is both a symbol and a tangible vote of confidence in Hawken School. It enables the leadership of the School to move forward with plans for the year or to expand upon innovative programs. Many alumni share that they give back to Hawken out of gratitude for their own experiences at the School. Parents often choose to give because they want to enhance the educational opportunities for their children. Participation rates are also a factor used by foundations, corporations, and other friends of Hawken when determining grant awards. Thus, higher participation rates can potentially generate additional support for Hawken. We hope that members of the Hawken community make the School a philanthropic priority. There’s no expected gift amount – we ask simply that you consider a gift that is personally meaningful and that makes sense for your family. Every year, every gift to the Hawken Fund matters and makes a difference for Hawken. Visit our Ways to Give page for information on the many ways you may contribute. I made a gift in June, but you asked me to give again in September. I thought this was an annual gift. Could you please explain? The fundraising schedule for the Hawken Fund coincides with Hawken’s fiscal year, which runs from July 1 to June 30. The gift you made in June counted toward the previous fiscal year. Gifts made after June 30 count toward the next fiscal year, which is why you were contacted again in the fall. Once an individual makes a gift or pledge, requests for financial support to the Hawken Fund stop for the remainder of that fiscal year. It seems like Hawken already has a lot of money. Will my gift really make a difference? Yes! The Hawken Fund is part of the School’s operating budget. It’s not extra funding; the Hawken Fund is needed every year. Hawken would need an additional $37 million in our endowment to equal the amount of money that comes from gifts to the Hawken Fund. The School relies upon gifts of all sizes to meet the needs of our students. Remember that participation is also a factor considered by foundations, corporations, and other friends of Hawken when determining grant awards. The percentage of our community that supports the School helps them gauge the strength of the School. Your gift of any size helps Hawken successfully pursue other funding opportunities. Support the Hawken Fund-click here to give today! Log into your Amazon account under Amazon Smile and a portion of each of your purchases will support the Hawken Annual Fund.